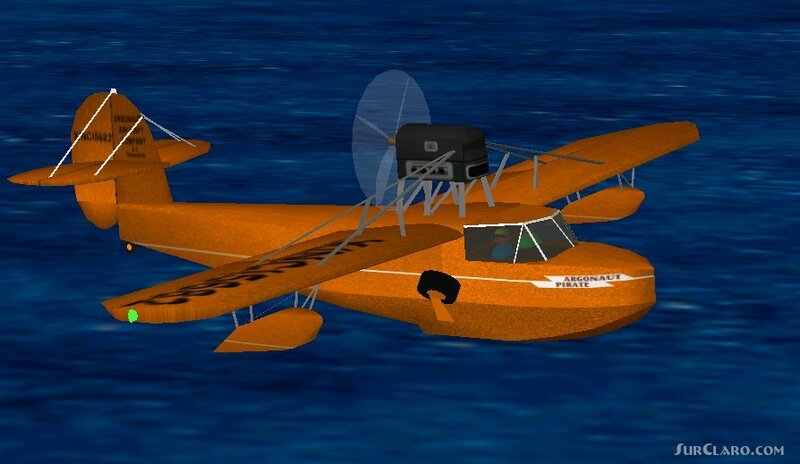 Flightsim FS2004 FS98 Argonaut Pirate Vintage Amphibian 1935 Three-place passengers cabin high-wing amphibian tail-dragger single wing airplane built by Argonaut Aircraft Inc., Tonawanda, NY. Its 125hp, 4-cyl in-line, air-cooled Menasco Pirate C-4 pusher engine, normally used for racing planes, gave it a top speed of 104 kt. It was made of plywood and fabric, had a retractable landing-gear, a 4-bladed wooden propeller and a cockpit with full instrumentation. Two models are supplied, one for landing on water, and one for land. Custom panel for standard guages included. Textures by Udo Entenmann. By Stephan Scholz.